Tulsi (Ocimum tenuiflorum) tea is tea made from the leaves of tulsi (holy basil) plant. 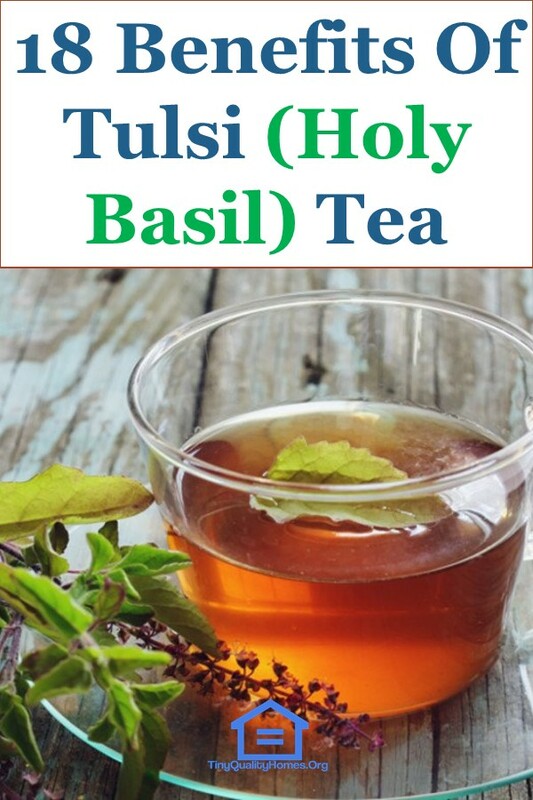 Tulsi is the Sanskrit name for holy basil. Tulsi has an active component, called eugenol, which has numerous health benefits. As such, Tulsi has been used in ayurvedic medicine since ancient times. Tulsi tea has antioxidant, digestive, anti-inflammatory, and stress-relieving properties which make it a very popular herbal tea. Tulsi tea contains a lot of antioxidants and can neutralize dangerous radicals in the body that can damage the tissues and cells. It allows proper functioning of the immune system and can reduce joint pain. It can also help the liver to function properly. It lets the body recover from the damage caused to tissues and cells due to radiation therapies or damaging sun rays. Those suffering from heart problems need to have this tea without sugar, two times a day. Tulsi tea is capable of reducing high blood pressure and bad cholesterol levels. It can purify blood and can ensure proper blood flow to the heart. It is also beneficial for those who have undergone any cardiac surgery. Tulsi is rich in antioxidants and can reduce stress in the body. Consuming this type of tea can provide relief from stress, and soothe the body and mind. Drinking this tea every day can reduce pessimism and fill the mind with optimism. Organic Tulsi tea is an effective stress reliever. Day by day our life becomes more and more stressful. With pressure mounting on the professional front as well as from personal life, you may find it very difficult to cope with the stress. A simple way for relieving this stress is to drink tulsi tea, or by chewing its leaves, you can overcome stress in no time. You would feel refreshed, and you would be able to think and handle things in a positive way. This herbal tea also promotes the respiratory health of people and can help in the therapeutic cure of various gastrointestinal health issues such as indigestion. The beverage has healing properties, which can inhibit the problems of degenerative disorders and premature aging. It is also equally beneficial in alleviating inflammation associated with arthritis. Most people today are caught up in an extremely stressful life, and this herbal tea is capable of reversing the damaging effects of stress on the body. Once stress level rises, there is a tendency for a rise in blood pressure levels. Tulsi tea is capable of controlling the level of blood pressure, and doctors recommend heart patients to drink it. As Tulsi is organically grown and its extracts are involved in tea preparation, it is entirely devoid of caffeine and other harmful things. The herbal tea has minimal side effects, and you can have it two times a day. It can refresh your mind and completely replenish your body. The tea is packed with antioxidants and can remove harmful free radicals from your body. The presence of free radicals can destroy the tissues and cells. Tulsi has natural sedative properties, and thus, it serves as a natural headache remedy and can also help relieve migraine pain. Tulsi essential oil, when mixed with water and boiled for a few minutes, can provide relief from a headache. This tea is critically also helpful in reducing headache due to cold in which nasal passage blockage puts pressure on the head. Our eyes are constantly subjected to the atmosphere which causes it to come in contact with bacteria present in the air. This exposure causes infections such as conjunctivitis and boils. Tulsi tea, when taken on a regular basis, helps improve eye health. Moreover, if an individual suffers from boils, then, it can provide relief to him or her as it is an effective anti-inflammatory agent. It helps sooth the pain also. Using rose water in eye drops, in addition to tulsi tea, can assist in healthy and clear vision. If an individual finds that he or she is having a bad breath issue, then Tulsi tea can serve as mouth freshener also. With its natural anti-bacterial properties, tulsi tea is not only able to fight bad breath but also, can be useful in mouth ulcers as well. Drinking one cup of tulsi tea a day can promote an effective and efficient dental care. People suffering from common cold, having a nasal blockage or respiratory issue, can use tulsi tea as an agent to relieve their pain. Tulsi tea is rich in camphene and eugenol, and when it is boiled in water, they provide a soothing effect in the nasal tract. Congestion relief is provided effectively by having a cup of tulsi tea regularly as tulsi is a prominent decongestant agent. Tulsi contains powerful antioxidants that are especially effective when it comes to protecting the cardiovascular system against free radical damage of high cholesterol. The antioxidants found in teas, such as tulsi tea, reverse the dysfunction of blood vessels, thus also preventing strokes. When the bacterial activity in your mouth increases, problems like plaque and cavities start increasing. Even bad breath, also known halitosis, is a very common problem among many people. All such teeth disorders can be treated by chewing tulsi leaves. Since many countries do not have tulsi plant, one can avail its benefits by drinking the Tulsi tea. If you do not spend some time in keeping your skin healthy, you can easily become victim to various skin problems like eczema, rashes, acne, etc. Extracts of Tulsi leaves on the skin can help in maintaining the health of the skin. Drinking Tulsi tea helps in inhibiting free radicals in the body and makes your skin appear healthier. The consumption of this tea improves endurance, stamina, and strength in the body. It can stimulate the body to use oxygen with utmost efficiency. Tulsi tea is rich in abundant phytochemicals that have beneficial effects on the digestive system of the human body. Tulsi tea helps in the process of metabolism, absorption, and assimilation of food and other products in the body Furthermore, tulsi’s anti-inflammatory properties are also useful for treating digestive disorders. It also has a healing effect on intestinal disorders. It is advisable during bouts of diarrhea to drink tulsi tea slowly for maximum benefit. Drinking Tulsi tea helps in preventing various types of cancer. It helps women prevent cancerous growth in the breasts, especially women in their pre-menopausal phase. It also helps increase the levels of globulin hormones during periods of the female menstrual cycle. The presence of anti-oxidants in tulsi tea also destroys abnormal cells in the body before they cause major damage by turning into cancer cells. For several decades, Tulsi tea has been consumed by numerous people for treating their fever. When there is a climatic change, our body may not be able to adapt to the climate quickly and because of which, we can suffer from common diseases such as fever. During such times, if you have tulsi tea, you would be able to realize how it helps in regulating the temperature of your body to normalcy. Drinking the mildly spicy tulsi tea enhances your metabolism and promotes weight loss. In this case, tulsi tea achieves this by improving fat metabolism in the body. It disintegrates fat cells in the body and keeps your body trimmed. Oxidation of food material is another function of tulsi tea. It assures safe disintegration of fat compounds and tends to eliminate the risk of obesity naturally.